We are inviting you to come dive into our colorful universe, offering vibrant & adventure seeking people the opportunity to explore & unleash their true potential. Leave you high on life ! 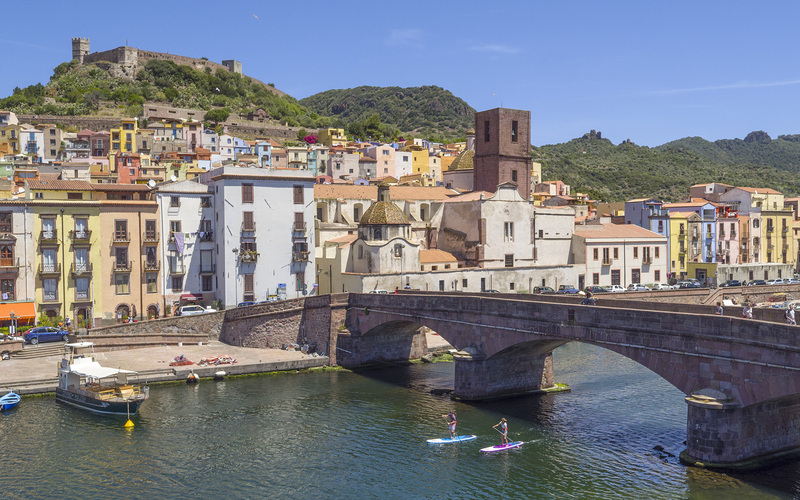 Visit one of the most beautiful towns on Mediterranean coastline in a more active way and see BOSA’s colorful architecture embraced with history from another angle. The real attraction of the area though lies in the warmth and hospitality of the local people, in their colorful traditions and folk festivals, in their delicious gastronomic specialties and in the aroma, color, and taste of the wine Malvasia di Bosa. 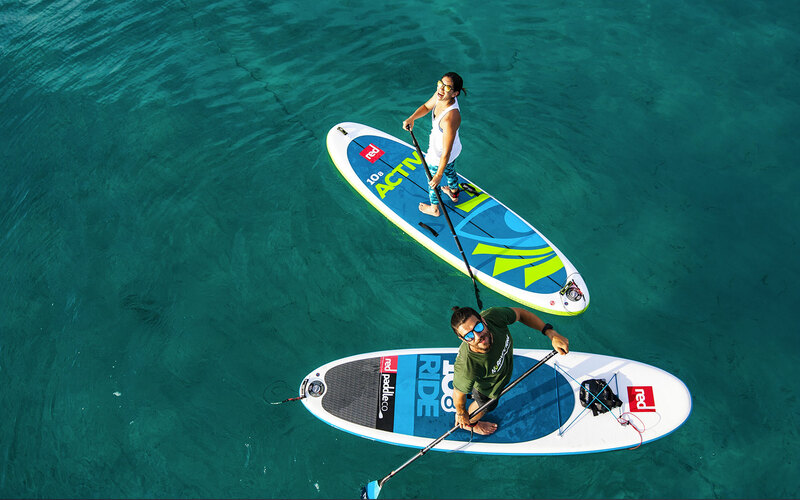 Stand Up Paddle Boarding… After breakfast, you’ll head down to the beach for your morning SUP lessons. 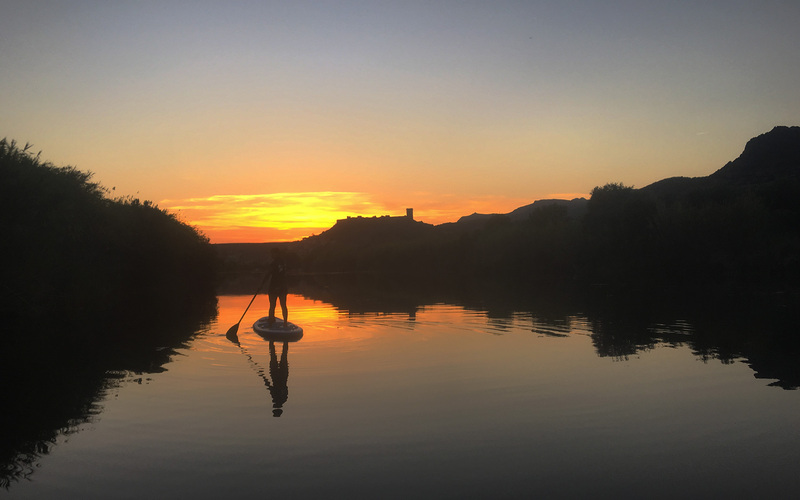 Our SUP school is run by qualified ISA instructors and we welcome all levels – including complete beginners. 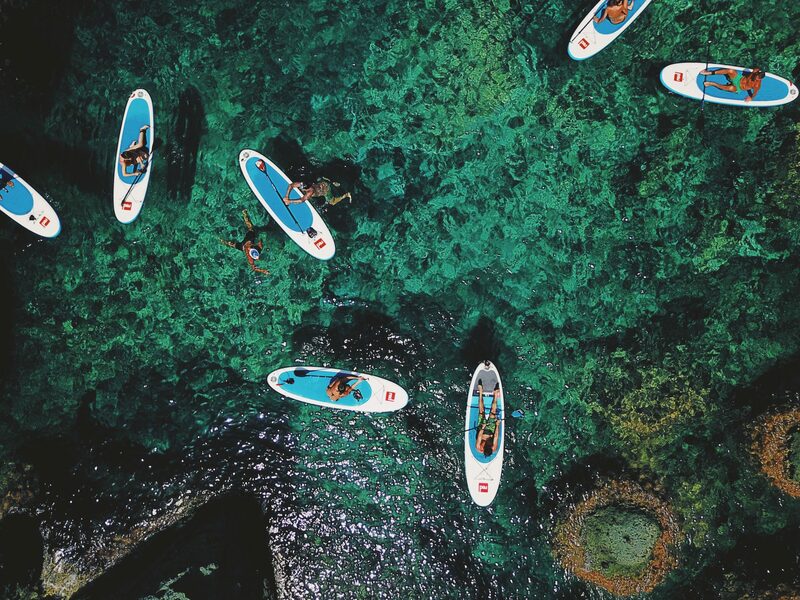 Stand up paddle boarding will give you one of the most amazing perspectives of the surrounding beaches and hidden coves in Sardinia. * The risks of becoming totally addicted to this sport are pretty high… We just thought you should know ! During the NuAdventure Experience, we will step on the mat every day! 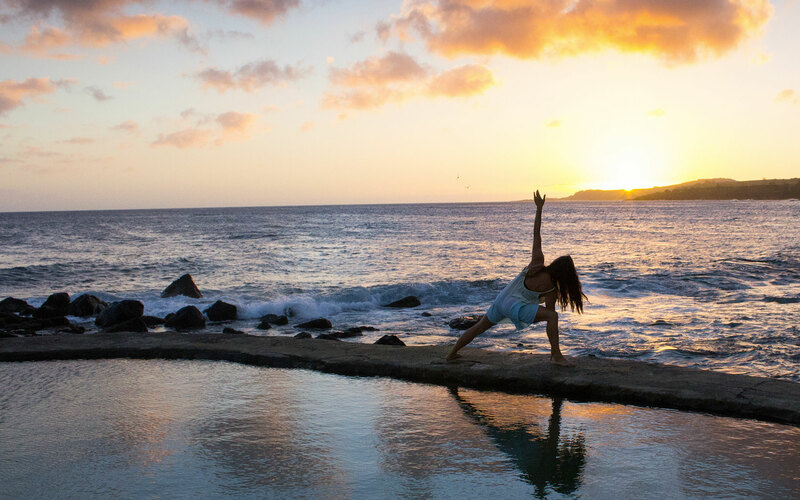 The practices will be Vinyasa-based and tailored to the group and each individual. Our intention is to accompany you into exploring beyond the practice of the poses. 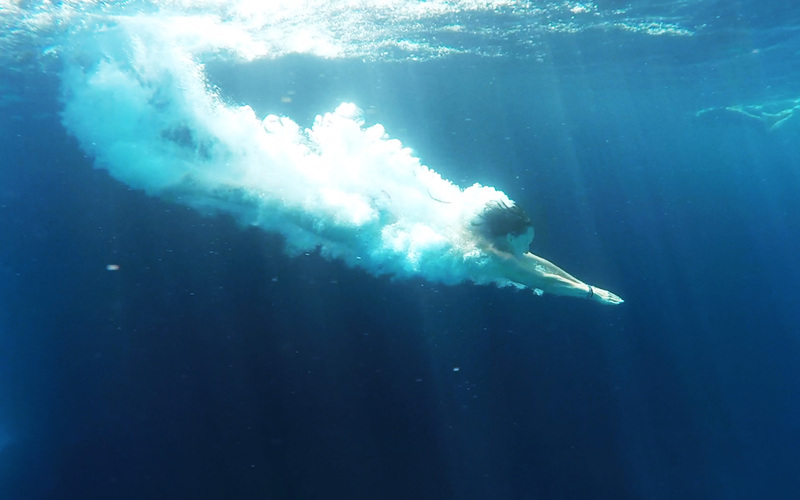 We will explore with you different styles, and will be introducing conscious breath-work. We will also combine the yoga practices with SUPYoga and/or other sessions in the afternoon. We will spend our days exploring and finding the nicest spots for stand-up paddling along the beautiful shoreline. We will ensure we don’t miss any of the stunning sunsets that the Islands offer. Busy bodies need to be fuelled with tasty and nutritious foods. We do this by eating real, fresh, nutritionally dense and seasonally relevant dishes. We try to strike a balance between healthy food and some of the Sardinian specialties. These are the slow foods that have been grown, procured and prepared locally according to ancient traditions. But of course, there may even be one or two modern treats along the way. To live this experience to the fullest, you’ll obviously need some very good fuel, and that’s why we thought of including a delicious & healthy menu. The NuAdventure’ approach is all about eating clean, without compromising the pleasure. 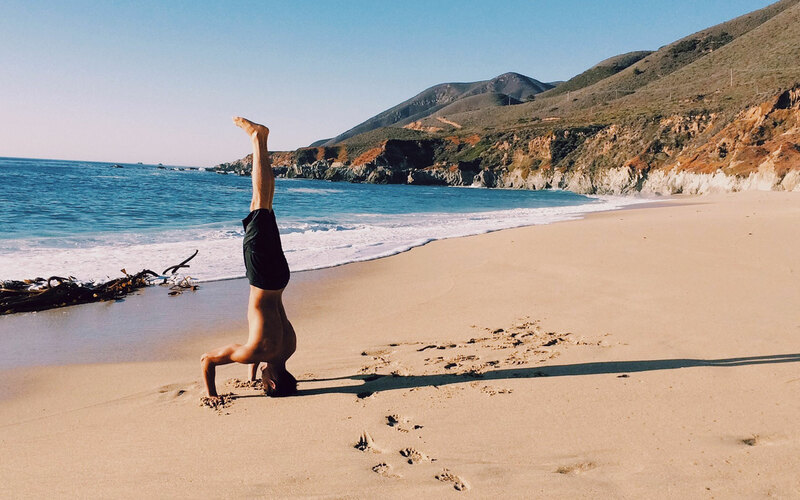 We believe in finding the right balance. In Sardinia, the wine has always represented an important resource, an ancient history which is capable of surprising even today; an indissoluble heritage from culture, from places and from people who live here. 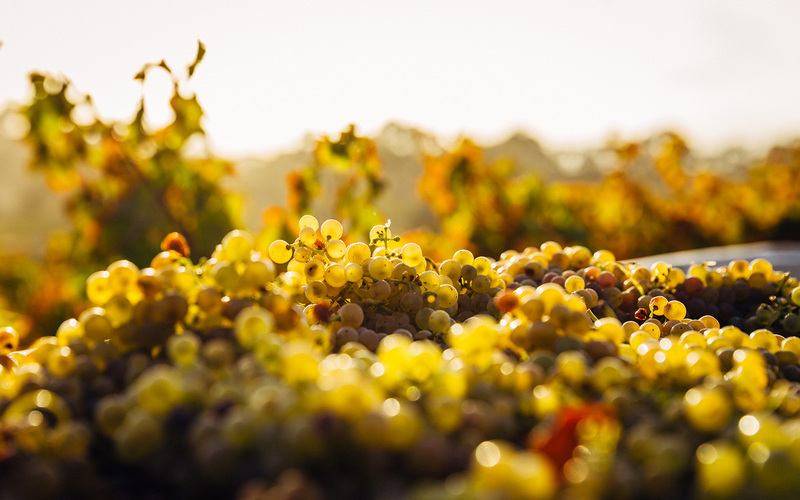 From white wines to reds, an enological path also passing in the other styles and, among them, authentic rarities, extraordinary representatives of the island’s winemaking, such as Malvasia di Bosa and Vernaccia di Oristano. Two wonderful examples of wines with an extraordinary ancient taste, which give their best with very long times of aging. The noble D.O.C. wine Malvasia di Bosa, which in these lands fins not only its cultural and social terroir but that here is still produced and refined thanks to the passion and pride of a few resistant vigneron, strongly dedicated to the protection and preservation of this rare grape and its delicious nectar. The “experiences” take shape in paths connected with wine, Planargia and the story that the generations of the vigneron can tell. 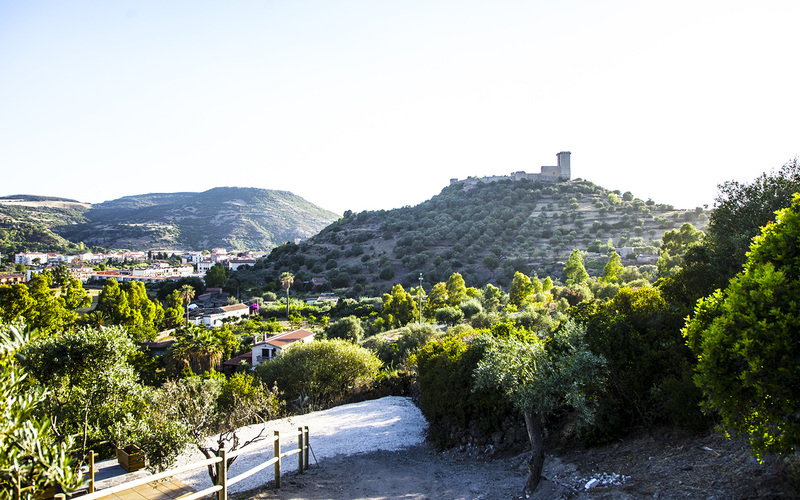 We combine the taste with the landscape beauty of Malvasia. Not Included: Flight ticket, Travel insurance (required), Massage, Professional Video & Photos, Lunch (Packed lunch) & Dinner ( every day in one of our partner restaurants that will offer you a special price, or at the hotel restaurant. To host our retreat guests, we have chosen a cozy complex of country houses surrounded by beautiful nature, just 2 km from the sea. Close to Bosa historic village, one of the main villages along the coast, they are located in a lovely area called “Località S’Abbadolzeddu”, totally immersed in nature and silence. 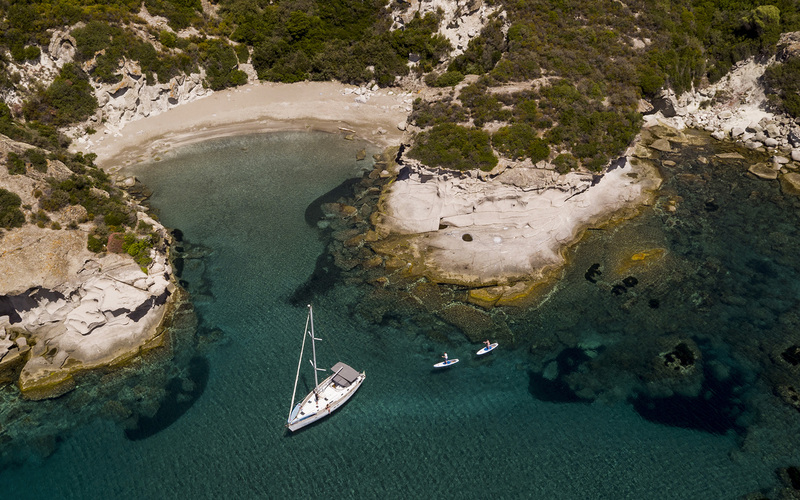 Meeting point and pickup at Alghero Airport 15 pm. Welcome meeting with the Crew. Going for a day adventure, with stops on different beaches, time for SUP Class and tour or Hike, swimming, snorkeling, trail run, Adventure of the day. 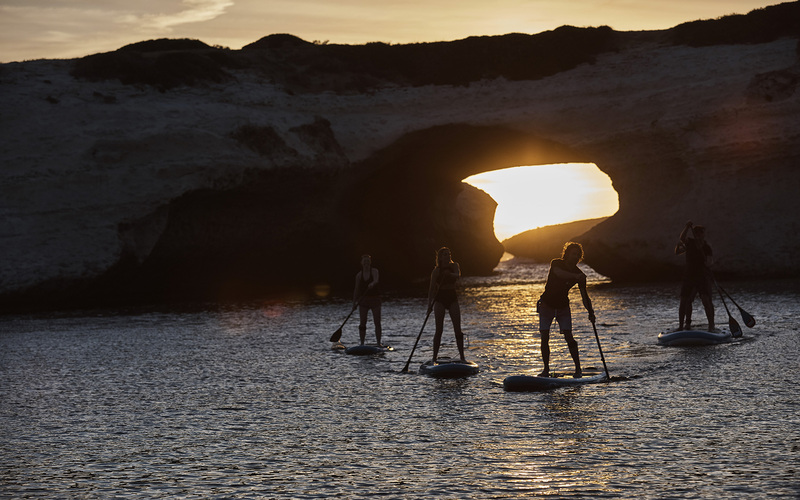 Evening Sunset Yoga or SUP Yoga class, sunset SUP Tour. For safety reasons, weather, and logistic conditions may change without notice the programs. 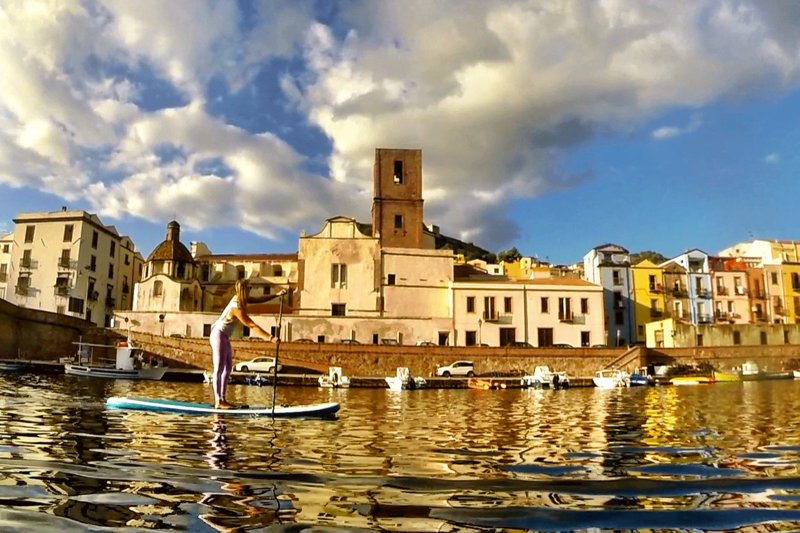 Explore the islands and beaches of Sardinia by Stand-up paddleboard and take your yoga practice to one of Mother Nature’s hidden playgrounds. This adventure is for women and man aged anywhere between 18 and 100 years old, that are ready to ignite their passion for adventure! We are looking for vibrant, passionate and active people, who are not afraid of getting wet & salty, who are willing to say Yes to new challenges, and who are thirsty to learn, share and welcome new perspectives. 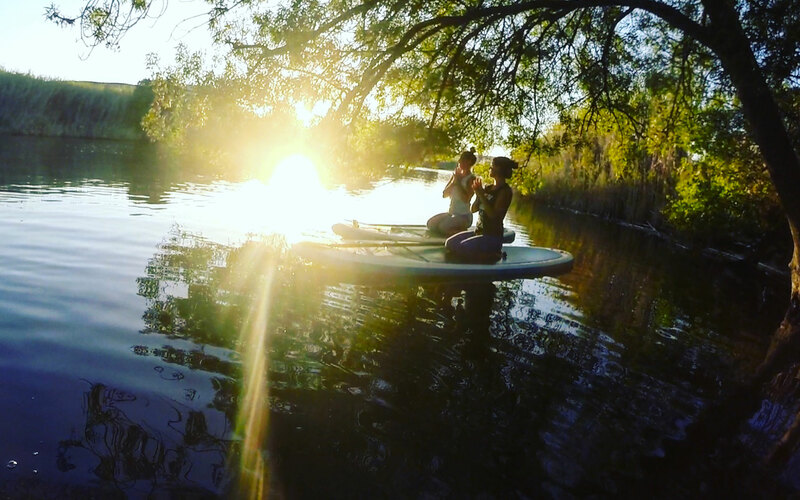 Having a burning desire to be part of this is all you need; no prior experience in yoga, SUP, climbing, hiking is necessary. If you are seeking a super relaxing retreat, filled with pedicures and manicures…sorry, but this is not the experience you are looking for.